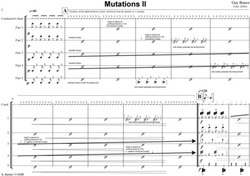 Mutations II was composed on the 11th October. It was written for my Master in composition as a response to listening to Louis Andriessen's Workers Union. In Workers Union pitch is indiscriminate with only a single line representing the middle range of the instruments. Andriessen states that any group of loud instruments can play the piece. All instrumentalists work from the same single-line score but interpret the pitch according to personal taste whilst maintaining the written rhythm. In Mutations II I wanted to employ a similar strict rhythmic structure and indiscriminate approach to pitch whilst looking at the contrapuntal possibilities within such rules. The piece is written for five parts with any amount of performers on each part. Pitch is relative with the single-line stave of each part representing the middle of any instruments range. The resulting aleatoric harmony is therefore dissonant and such percussive clashes bring out the rhythmic aspect of the piece. The choice of instruments used will vary in each performance as will the interpretation of pitch. In the first section, the performers begin playing their chosen notes in time but gradually go out of phase. By the middle section (just over a minute in) the performers have reached the speeds designated in their parts and as a result they come together in a polymetric rhythm. Each part in tern turn then presents a new motif which is taken from a traditionally African drumming pattern. When all five parts have mutated into the African rhythm, the pitch begins to change towards the climax.